"The Power of the Dog" by Rudyard Kipling is the Songs of Eretz Poem of the Day for March 15, 2014. It was also offered as Poets.org's Poem-A-Day on the same date. Since the poem is in the public domain, I have taken the liberty of reprinting it here in its entirety. 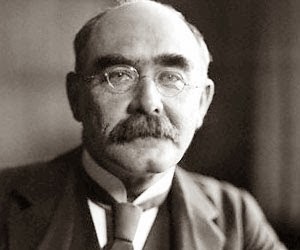 Joseph Rudyard Kipling (1865 - 1934) (pictured below) was born to British parents in India, where he spent the first five years of his life and his late teenaged years. He began publishing poetry at the age of twenty-one and rapidly became well-known and popular. He was also famous for his novels and short stories, and was awarded the Nobel Prize in Literature in 1907. Additional biographical information and links to other poems by the same poet may be found here: http://www.poets.org/poet.php/prmPID/136?utm_source=PAD%3A+The+Power+of+the+Dog+by+Rudyard+Kipling&utm_campaign=poemaday_031514&utm_medium=email. This poem really moved me. 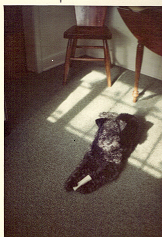 I had a Kerry Blue Terrier growing up, Shannah (pictured below right). She came into my life when I was seven and lived for seventeen years. She always wanted to catch a squirrel, but was never successful in this endeavor, at least not to my knowledge. One day, when I was twenty-four, I came home from medical school to visit and found Shannah looking old and decrepit. She was stretched out on the back porch steps, enjoying the sun. It had been some years since she bothered to chase a squirrel, but when one walked into her line of sight that day, her head came up, and her ears moved forward. Suddenly, she exploded into action, streaking after the squirrel just like she used to in her prime. It was beautiful to see--breathtaking. It ended as it always did--with the squirrel safely in a tree and the dog disappointed. Shannah turned away from her treed nemesis and walked slowly back to her step (but see below Editor's Note). * A week later, she was dead. It was one of the saddest days of my life. Five years ago, nearly twenty years since Shannah died, I bought an Airedale Terrier, Lana (pictured above opposite the poem). My daughter was seven. I have given my heart to Lana, just as the Kipling poem warns against. I do enjoy having her in my life, but always lurking in the back of mind is the knowledge that she will not live long. When those thoughts occur, I do my best to try to enjoy her even more while she is still here. *Editor's Note: My mother remembers this incident differently. She recalls Shannah collapsing and requiring assistance to return to the porch step. The following year, there were three white crocuses blooming where she fell. Thank you for posting this great poem and the lovely picture of your dog. The bond between humans and dogs is so mystical and profound. Losing a dog is always devastating.